This large pelagic seabird is dark greyish-brown with white on the underside of its wings. Its wings are long and narrow, and its tail is short and rounded. Like other shearwaters, the sooty shearwater is a tubenose — meaning its hook-tipped bill has nostril tubes. This makes it appear as if a chunk is missing out of the bill. Its bill is long and dark grey. While the sooty shearwater spends most of its time on open ocean, it can be found closer to shore where the water is deep enough. Despite this, it is not infrequently sighted in some of BC's more protected waterways, and is often spotted from shore. It tends to gather in groups of hundreds or thousands while in flight or resting on water. It nests on islands in the Southern Hemisphere from September to May, and migrates in a figure-eight pattern across both the Pacific Ocean. These migrating birds are seen along the Pacific coast of North America in summer; some birds, which may be non-breeding, are present year-round. This species also migrates north through the Atlantic Ocean. The short-tailed shearwater (Puffinus tenuirostris) can be very difficult to differentiate from the sooty shearwater. Individuals of the former often have white on the inner wings, but this white patch tends to be less extensive and contrasts less with the rest of the bird's dark plumage. Its bill is also shorter and thinner. Other similar species are the pink-footed shearwater (​P. creatopus) and buller's shearwater (P. bulleri). These two are more likely than the short-tailed shearwater to be encountered along the BC coast, but can be more easily distinguished from the sooty due to their lighter undersides, the Buller's lighter back, and the pink-footed's distinctive pink bill and feet. In New Zealand Maori people conduct a controlled harvest of young for use as food and oil. A study published in 2006 found that migrating sooty shearwaters traveled 64,037 km (+/- 9, 779 km) round-trip during their figure-eight migration pattern through the Pacific. This was the longest electronically-tracked animal migration in the world at the time, but has since been surpassed by the Arctic tern. Dunn, J. L. and Alderfer, J. (Eds.). (2011). National Geographic Field Guide to the Birds of North America. (6th Ed.). Washington, D.C.: National Geographic Society. Pp. 88-89. Inman, M. (2010). World's Longest Migration Found--2X Longer Than Thought. National Geogaphic News. National Geographic. Accessed 27/10/2015. Shaffer, S.A., Tremblay, Y., Weimerskirch, H., Scott, D., Thompson, D.R., Sagar, P.M., Moller, H., Taylor, G.A., Foley, D.G., Block, B.A. and Costa, D.P. 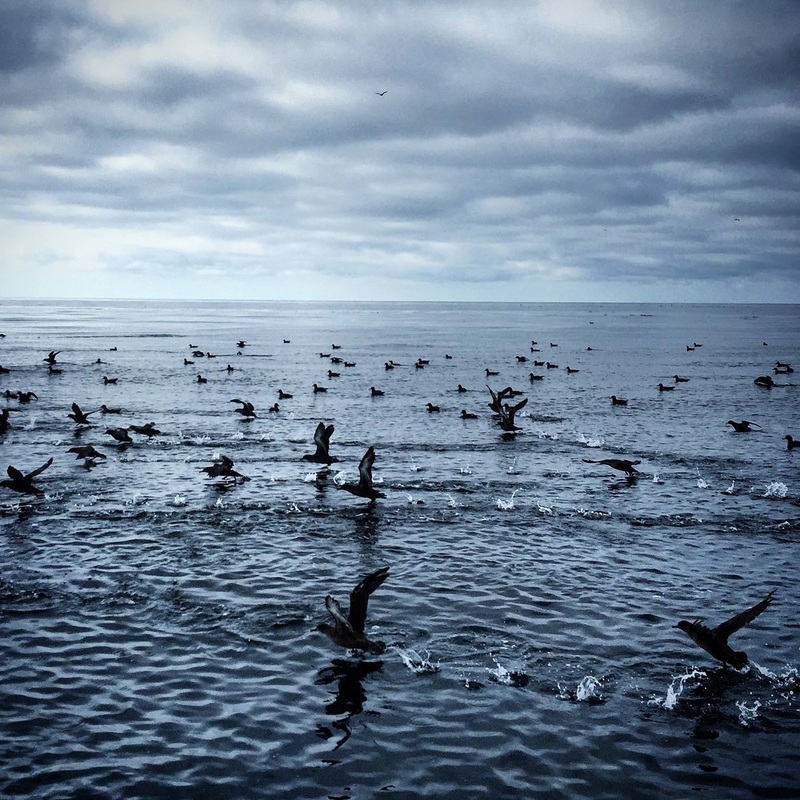 (2006) Migratory shearwaters integrate oceanic resources across the Pacific Ocean in an endless summer. PNAS, 103(34): 12799 - 12802. Sooty shearwater (Puffinus griseus). ARKive. Accessed 27/10/2015. Sooty Shearwater Puffinus griseus. Audubon Birds. National Audubon Society. Accessed 27/10/2015.